Hexapods, six-legged parallel-kinematic machines, are quickly gaining ground in a broad range of industrial automation applications after “learning” how to directly communicate with PLC or CNC controllers via fieldbus interfaces. As far as the semiconductor and electronics industry, automobile industry, and precision assembly are concerned, many production processes have become inconceivable without them. Today, the six-axis positioning systems are available with load capacity from 2kg to 2000kg and travel from 10 to hundreds of millimeters, while maintaining sub-micron precision. 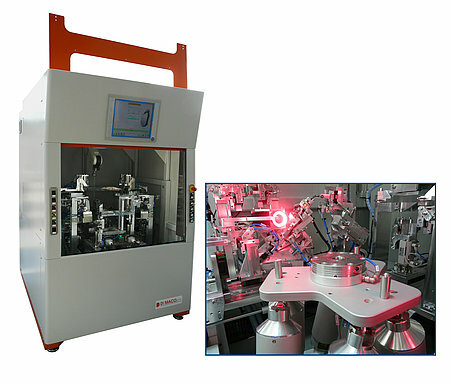 Hexapods are used for aligning the smallest optical components in the latest Silicon Photonics production processes, as controlling automated labeling machines, and positioning entire body parts for automotive production. The intrinsic Hexapod features contribute to a wealth of new possibilities in robotics. There are two methods of constructing multi-axis positioning systems: serial kinematics and parallel kinematics. Stacked serial kinematic systems are easy to design and control. However, there are a number of drawbacks compared to the more powerful and elegant group of parallel kinematic machines. Each actuator in a serial-kinematic multi-axis system is assigned to exactly one degree of freedom. When position sensors are integrated, they are also each assigned to one drive and only measure the motion on the corresponding positioning axis. Any undesirable motion in the other five degrees of freedom, which for example, occur as a result of guiding errors of the individual axes, cannot be detected or compensated. Contrary, in a Hexapod, all actuators directly drive the same platform. The accumulation of drive train and guiding errors – common with stacked systems – does not occur with well-designed parallel kinematics. Hexapods also have no dragged cables, reducing friction or torque on the motion platform while increasing lifetime. 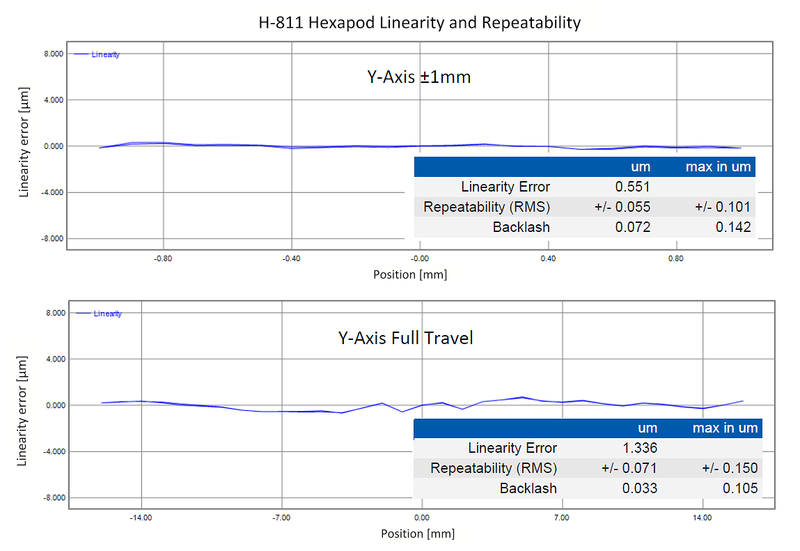 In addition, Hexapods are stiffer, more compact, and together with a significantly reduced inertia (moving mass), can provide faster response and settling resulting in higher dynamics, repeatability, and accuracy. While the mechanical design is critical for stiffness, accuracy, repeatability, and lifetime, and many details (such as spherical rolling joints) that seem like a good idea at first glance turn out to be a dead end, the flexibility and versatility depends on the controller and software. For example, unlike with serial kinematics, if you want to move a platform in just one axis, the controller has to change the individual lengths of each strut – some will extend and some will contract. The required coordinate transformations and path calculations need a powerful controller capable of running 100’s of thousands of operations per second, because there is no linear dependence on the current coordinates. The stiffest mechanical designs are based on cardanic joints with an offset between the axes, making the math even more complex. Generally, there is no analytical solution, and CPU-intensive, iterative algorithms are required to recalculate the complex Hexapod kinematics for each step. All of this is transparent to the user who does not need to worry about implementing the Hexapod kinematics on the PLC. 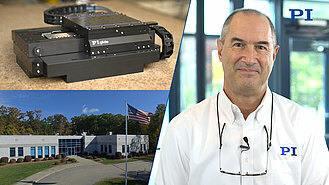 A dedicated digital Hexapod controller, continuously improved over 3 decades, serves motion with sub-micron precision by tightly controlling each actuator in real time. 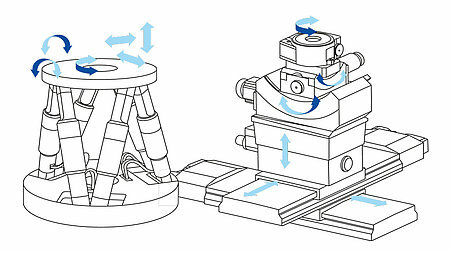 Linear and rotary motion of the platform is simply commanded in Cartesian coordinates. 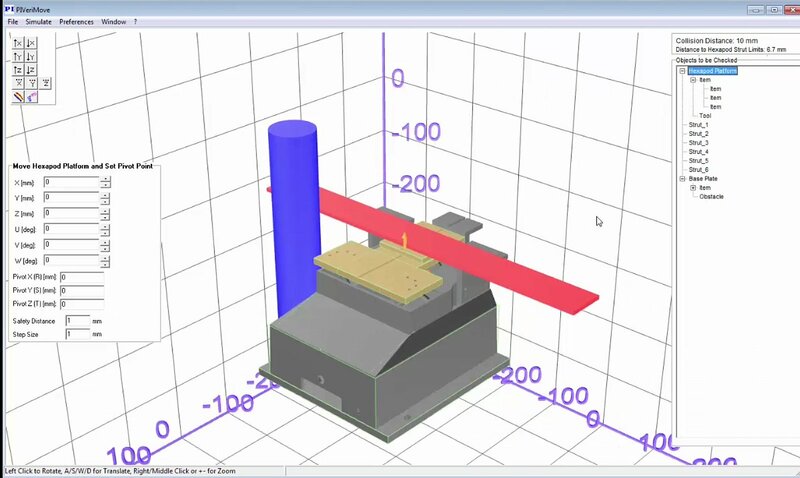 An essential feature of the Hexapod system allows the adaptation of both the position and the alignment of the reference coordinate system and the pivot point by simple software commands. To adapt the trajectory perfectly to the requirements of the application, work and tool coordinate systems can be defined referring to the position of the workpiece or tool. This function saves valuable time in industrial automation and photonics alignment tasks. 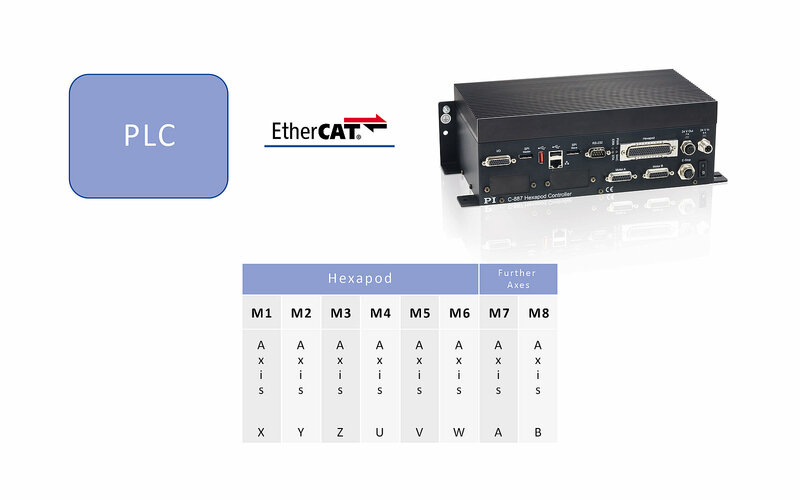 All PLC standard language functions are available for controlling the Hexapod systems; the controller communicates with the Hexapod via a standard protocol. 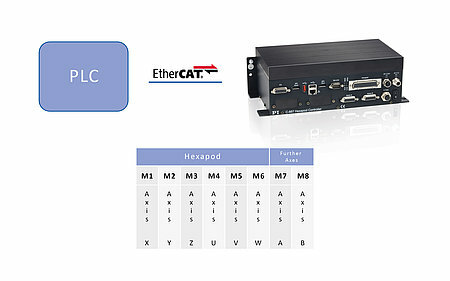 Established fieldbus protocols, such as EtherCAT or ProfiNET, are available for this purpose; additional RS232 and TCP/IP interfaces are integrated as well. With the help of these interfaces, it is possible to exchange time-synchronized data, such as target and actual positions or status information, in real time both with the Hexapod system and any other components in the network. 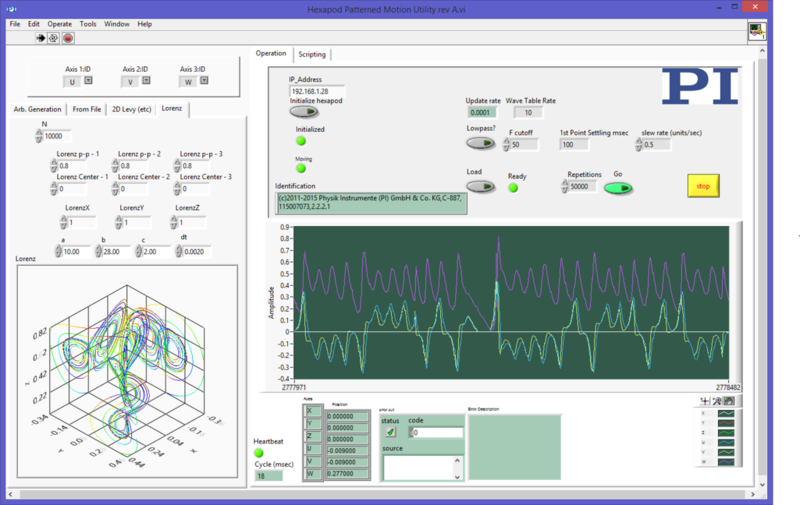 In a typical automation application, the corresponding Cartesian target positions, or trajectories, are generated by a master controller (e.g., a standard software PLC with TwinCAT) and transmitted to the Hexapod system, via the EtherCAT protocol or similar, and in return, the actual positions and status information can be polled. 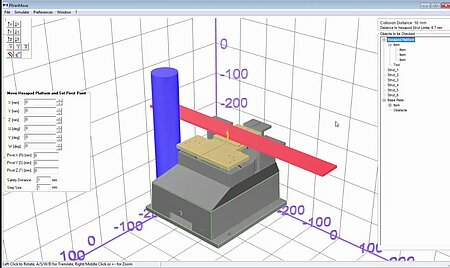 System parameters, such as the center of rotation and the coordinate systems, can also be conveniently configured. 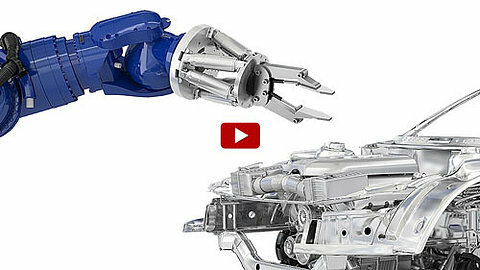 The Hexapod system behaves as an intelligent multi-axis drive on the bus. The areas of application for the versatile Hexapods are broad-ranging, because there is no difference between precision positioning of semiconductor components or mechatronic components or heavy loads. 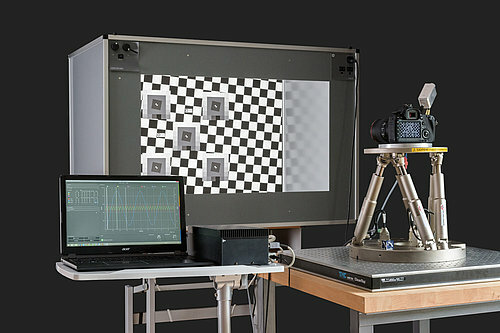 For example, automated 6D alignment systems take care of important tasks during testing and manufacturing of accessories for MEMS (Microelectromechanical Systems) camera sensors and photonics components, including the alignment of optical fibers and fiber arrays, the production of optical lenses. 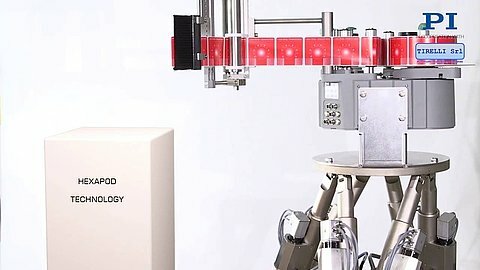 Hexapods can be combined with Cartesian robots (gantry systems) to provide very large motion ranges and high flexibility. 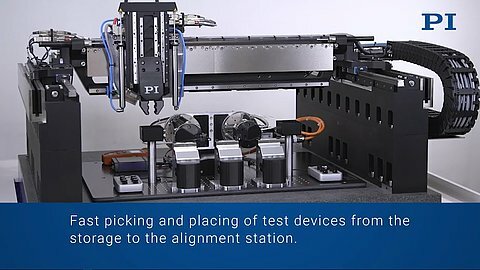 The video shows an application in fiber array alignment and other photonics test and manufacturing processes. 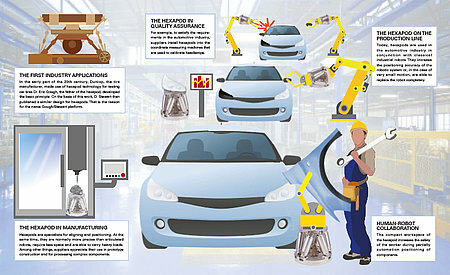 Further applications can be found in the “classical” industrial environment, such as material processing, when several axes are required, or inspection systems in the automobile industry. Precision alignment on several axes can also be important for heavy objects, such as mirrors and reflectors in large telescopes, precisely positioning and aligning patients to a radiation source for tumor diagnosis and therapy or inspection systems for large-format flat panels. Hexapods can carry loads up to 2 tons at any orientation and if required, be mounted upside down. Because the maximum permissible load of a Hexapod system depends on various parameters, such as the mounting position, the center of gravity of the load and the current position, suitable simulation programs are supplied that enable convenient set-up. They also allow easy determination of workspace and motion limits depending on the selected center of rotation or the current position. Motion simulators make high demands on motion dynamics. They repeatedly perform defined motion cycles, for example, for quality assurance and function monitoring of products in mobile use. Typical examples for this include inspection systems for acceleration or gyroscopic sensors, like those used in smartphones, cell phones, and cameras for detecting changes in position. They are tested by means of a specified motion pattern. Similarly, this applies during testing of image stabilization systems in cameras when the algorithms and mechanics are tested for effectiveness. For this, precise, repeatable, natural, and artificial motion must be simulated with the same dynamics and accuracy on all linear and rotary axes. Hexapods are predestined for these tasks and PI offers Hexapod systems that are certified according to CIPA (Camera and Imaging Product Association), which are used for testing image stabilization systems. The digital motion controllers from PI are supplied with a comprehensive software package that covers all application aspects, starting with easy start-up to the convenient control of the systems using graphical interfaces to fast and manageable integration into external programs. A virtual controller allows development of application programs without any of the components at hand. Simulation tools help to calculate the workspace and make sure that collisions with external objects are avoided. A mobile app enables wireless monitoring and control. Development libraries and example applications simplify implementation and the following common programming languages and software environments are supported (C, C++, Python, Visual C++, Visual Basic, and Delphi or LabVIEW, MATLAB, μManager, EPICS, TANGO, MetaMorph as well as all programming environments that support loading of DLLs).